Eagle Brewery | Historic Jacksonville, Inc. The Eagle Brewery on South Oregon Street was in operation by 1856 and was probably Jacksonville’ first brewery. In 1861, German born Joseph Wetterer acquired the brewery and constructed the saloon building in front of it. 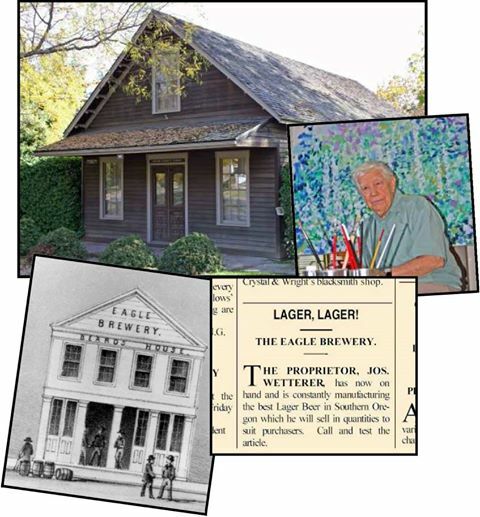 For the next 18 years, Wetterer advertised “the best lager beer in Southern Oregon.” In the 1960s, the complex became the studio and residence of nationally known artist Eugene Bennett, a far cry from its more raucous years as one of Jacksonville’s earliest saloons. It now serves as a private residence.